The global demand for Laser Phosphor Display Technology is forecast to report strong growth driven by consumption in major emerging markets. More growth opportunities to turn up between 2018 and 2025 compared to a few years ago, suggesting the rapid pace of change. Companies quickly adapting to this changing landscape are emerging as top performers and earning attractive revenues through a sustainable transition, innovation, efficient pricing and sales execution strategies. Increases in both domestic and export-oriented revenues are observed for key players in the global Laser Phosphor Display Technology market. However, challenges such as increasing buyer bargaining power, emphasis on high-quality products at low costs are forcing significant changes in the Laser Phosphor Display Technology’ supply chain. The ‘Global Laser Phosphor Display Technology market outlook report’ from 2017 to 2025 is a comprehensive work on Laser Phosphor Display Technology industry. This research study analyzes the penetration of Laser Phosphor Display Technology across applications worldwide. Focusing on the factors driving and challenging the new industry dynamics, this research report presents a strategic analysis review of global Laser Phosphor Display Technology market. The report analyzes the current market size in terms of revenues based on the average prices of Laser Phosphor Display Technology products worldwide. 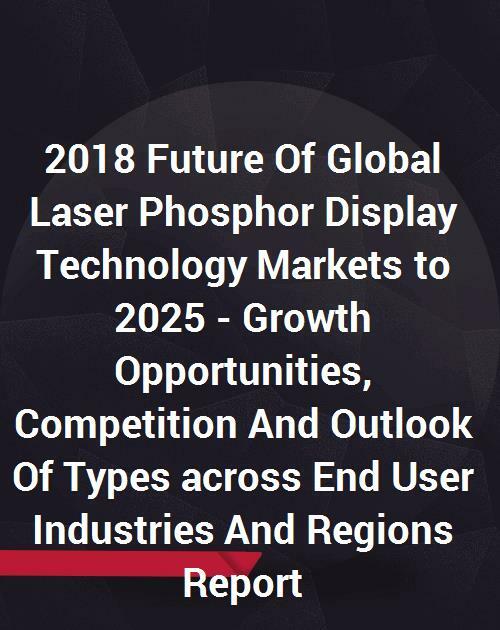 The study also presents a 7-year outlook on the basis of anticipated growth rates (CAGR) for different types of Laser Phosphor Display Technology and the industry as a whole. Further, detailed pricing analysis of products is provided in the report. The report also explores how Laser Phosphor Display Technology manufacturers are adapting to the changing market conditions through key industry strategies. The existing companies in Laser Phosphor Display Technology market are identified and ranked according to their market shares. In addition, company to company comparison (Company benchmarking) and product-to-product comparison (Product benchmarking) are included in the research work. It presents key competitive factors that are vital for companies to excel in challenging market conditions. To provide insights into the operating companies, business profiles of leading Laser Phosphor Display Technology manufacturers are included in the report. Region wise dynamics and growth prospects across segments are provided in the report. Further, application wise and geography wise market sizes of Laser Phosphor Display Technology are forecasted. This global deliverable scope spans across 4 key regions that include Asia Pacific (APAC), Europe, North America and Rest of the World (RoW) markets. For computing the current market value of Laser Phosphor Display Technology market and to assess its future potential, key business opportunities along with potential challenges are considered. Impact of price fluctuations and macro, micro factors affecting the prices of Laser Phosphor Display Technology across different applications have been analyzed in the research study. The forecasts are made on the basis of multiple drivers and challenges together with geographical, technological and product-specific trends and recent industry developments.